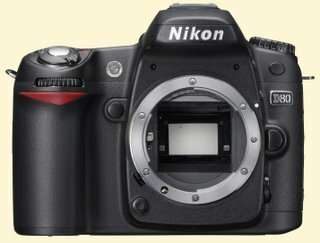 Nikon D80 (introduced August 9)—Despite stiff competition, the Nikon D80 nosed out in front of the pack as the best all-around camera introduced in 2006. 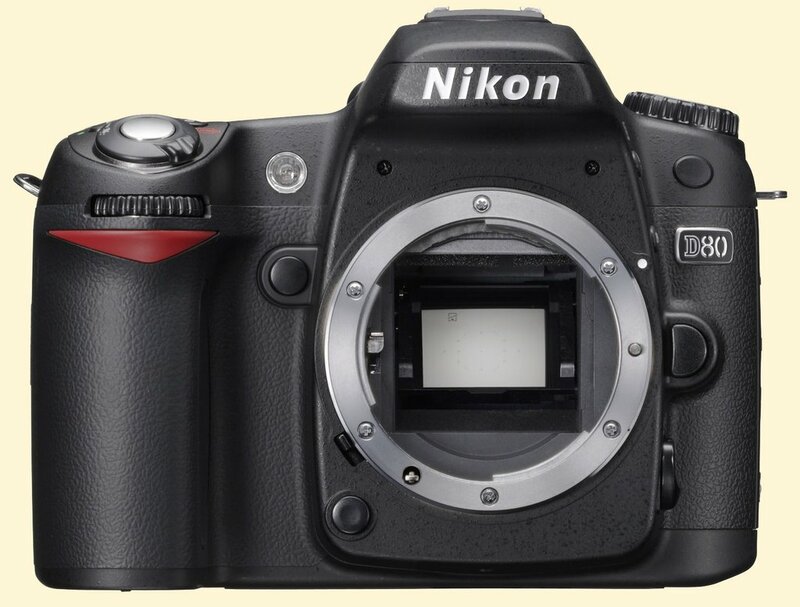 More than a mere upgrade of the popular and competent D70[s], the up-to-the-minute, 10-MP D80 is a careful and thorough all-new design, with superb Nikon ergonomics in a body that is even more ideally sized and shaped than the D70. Nikon is on a roll with its outstanding recent camera designs, and continues to win points among camera buyers—and plaudits from the likes of us—for its unstinting downward migration of features and capabilities from its more professional models: the D80 inherits a surprising amount of technology from the D200, which in turn provides a surprisingly large dose of the capabilities of the full-tilt-boogie D2Xs. Build-quality is a cut above for the price-point (the Sony A100 and Canon Rebel XTi feel flimsy in comparison), responsiveness is excellent, and, importantly, there is evidence in the D80 that Nikon is giving serious consideration to the viewfinder, which remains a serious if somewhat under-criticized weakness of many entry-level DSLR designs. Although some (not us) may fault the D80 for having an APS-C size sensor, and others (including us) might still wish for in-camera VR (vibration reduction) at least as an option, the D80's astutely-judged mix of high image quality, responsiveness, ergonomics, and in-the-field usability mark it, if only by a small margin over its capable competition, as the year's standout. 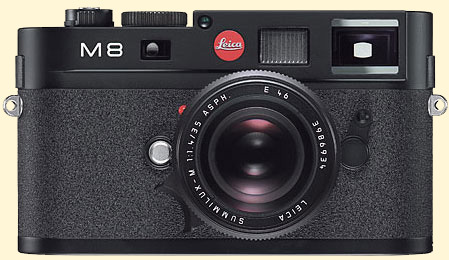 Leica M8 (September 14th)—Although plagued with early problems, the first digital Leica M is an important bridge to the past, a much-needed rangefinder alternative to the SLR-style design that's becoming ubiquitous, and a step forward in terms of applying traditional controls and very high mechanical build quality to serious modern digital cameras. That it can be used with most Leica (and other M-mount) lenses is exciting and a huge plus. 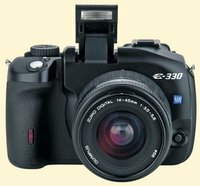 Olympus E-330 (January 26th)—The compact consumer 4/3rds DSLR is the first to offer full-time live preview on its LCD screen. Although not sufficiently appreciated by some reviewers, this is a feature that many photographers miss when switching from digicams to DSLRs. Olympus continues to lead the way when it comes to thinking creatively about digital camera design. Pentax K10D (September 13th)—The first pro/semi-pro body from Pentax in many years and the first semi-pro DSLR from the company, the beautifully sculpted and very well-made K10D earns our admiration for its in-the-body SR (shake reduction), anti-dust mechanism, accessory grip, and weatherproofing—the only current 10-MP DSLR with all these features—and it gets extra points for its accompanying set of very useful, designed-for-digital compact primes. Mike, was the Nikon D80 your choice? If so, I'm really surprised you picked it over the Pentax K10D, especially considering that the D80 lacks anti-shake, and we know you love that feature. 1. Custom functions. I changed about half of them to get the camera to work how I wanted. 2. Auto ISO. Just turn it on and forget about ISO. 3. Surprisingly good colour in low light. I agree about the build quality difference between the D80 and the XTi. The XTi is more toy-like and really looks awkward when attached to a big lens (though it doesn't feel as awkward as it looks). Still, the XTi is what I bought. I found the controls to be well laid out, the LCD to be bright and informative and the feature set to be just about right. And I sank the $250 I saved versus the D80 into the f/4-5.6 18-85mm IS. The XTi is an evolutionary camera that doesn't really belong on a best of list. But it's still a really great evolution, and IMO one of the best overall cameras on the market today. I treated myself to an E-330 when Adoram started selling them for $570 (I already own an E-1). I was in such a tizzy, I also added the 11-22 zoom, and the 50mm macro lenses. Also, if you change shooting modes, then any flash comensation that had been dialed-in gets reset to 0 :-( again! All in all, though, it's a treat of a camera, and the live view mode is a definite positive feature. I look forward to what Oly is able to do with this in the future, and I too hope for anti shake in camera in some futire body. I had briefly tried living with a Sony DSC-R1 fixed lens camera, but just couldn't live with the inability to shoot bursts of RAW shots. The image quality certainly had nothing to be embarrased about, and the price was right. 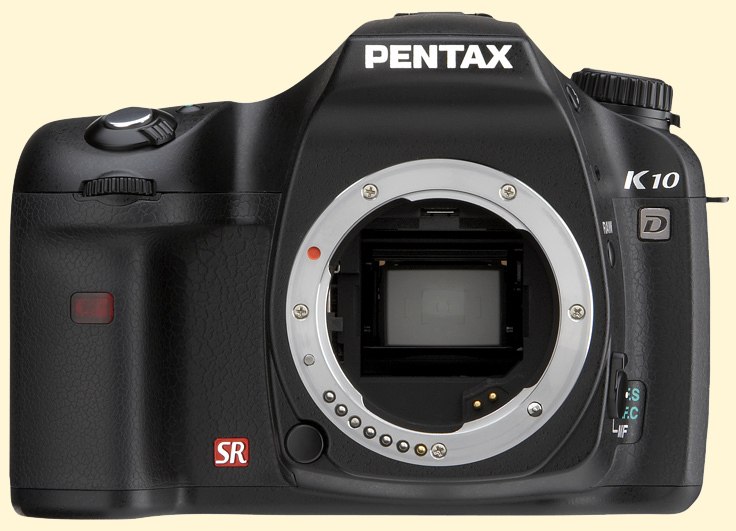 Before buying the E-330, I was awfully tempted by the Pentax K10D, but as it would mean adding a new line of lenses, I wimped out. It was the only 10 megapixel class camera I considered, not only for it's admirable feature set, but it appears to be an excellent ergonomical camera. In the end, of course, I'm of the opinion that the camera you are comfortable using is the one to use. I'm unaware of any DSLRs that don't produce excellent photos. Good choices; for me it's a toss-up between the K10D and the D80, with the K100D being the best low-budget option. I have tried and tried to figure out a good way to hold the XTi without a battery grip -- uncomfortable any way you hold it. Mike...all good selections. The only point I would like to make is that the M8 and Leica are garnering unwarranted innovation kudos for something Epson did a full two years before them with the RD-1. It's a shame that Epson never figured out how to market the camera because it is a real gem. The XTi is only uncomfortable if you try to hold its entire weight with your right hand. Once I get to shooting with the XTi, I have pretty much all of the weight of the camera and lens in my left hand. My right palm is completely off the camera, with two fingers on the grip, one on the shutter, stabilizing with the thumb. It feels fine. It's stable I can shoot like that for hours. It's not the same grip I used with my Digital Rebel 300D, but it's not uncomfortable. I have to say, I'm surprised the K100D didn't even get an honorable mention. Sure, the K10D beats it on all features, but unlike the D50/D40 and the low-end Rebels, the K100D is the first uncrippled real DSLR you can get for $600. If the K100D didn't exist, I still wouldn't have a DSLR. I got the kit, the batteries, the charger, the fat SD card, the card reader, and two lenses off of eBay for the price of the D80 body alone. I'd like to know why you chose the D80 over the K10 given all you've said about anti shake. Since it also has weather sealing, access to older Pentax lenses and the new limited primes I'm even more intrigued by your choice. Perhaps you'll enlighten us. What I'm glad about, with this year's crop of 10MP cameras, is that there are no huge compromises in the sub-$1000 SLR market anymore. The Canon, Nikon and Pentax models on offer aren't really missing any major features for the sake of artificial market differentiation. The only thing that really counts is the D80's inability to meter with early Nikkors, which the D200 manages. One would have thought they could at least make it work in stop-down mode without adding hardware. It's also the year where Canon's advantage at the low-to-medium priced sector has evaporated. The XTi remains competitive, albeit with less build quality than the other cameras, but it's certainly not in the lead; the 30D is not competitive against the cheaper cameras from Nikon and Pentax unless you really need that five-frames-per-second. Canon seems to have lost that competitive edge, and seem to be recycling products with only minor improvements. Hopefully 2007 will see some genuine innovation from the company. The cameras due for a total workover are the EOS-1D models and the 30D; they need, IMO, more than just more megapixels to really excite anyone. I couldn't wait to read the comments on this one, and I wasn't disappointed! No matter which camera you choose, nothing gets the discussion juices flowing like picking one camera over another one. Someone will always disagree with your choice, no matter what you choose, and I love reading why. Since choosing a camera is more subjective than than most of us are willing to admit, the responses to this kind of article are often more entertaining than the article itself. Whenever a "Camera of the Year" article runs in any publication, some responses will be interesting and well thought out, some are mostly emotion, and a few are laugh-out-loud funny, but it's always good reading. Thanks for the late Christmas present to your readers!